The black Olympus OM-D E-M1 Mirrorless Micro Four Thirds Digital Camera is a compact, ergonomically designed camera featuring a 16.3 megapixel Live MOS sensor and TruePic VII image processor to produce high-resolution still imagery and full HD 1080p video with notable low-light quality and high-speed performance. The combination of these two technologies enables a high sensitivity range from ISO 100-25600 and also contributes to a top 1/8000 sec. shutter speed and continuous shooting up to 10 fps. The sensor also lends itself to an enhanced FAST autofocus system that utilizes dual contrast- and on-chip phase-detection focusing methods to quickly and accurately acquire focus with selectable focus areas for even greater precision. Also benefitting image sharpness is in-body 5-axis image stabilization that compensates for vertical, horizontal, and rolling camera shake. IS-Auto mode can also be employed, which intelligently detect both vertical and horizontal panning and disengages image stabilization along the detected axes to provide stabilization when photographing moving subjects. Both a high-resolution electronic viewfinder and tilting touchscreen monitor are available for live view monitoring, image playback, and menu navigation. The interactive EVF features a 2,360k-dot resolution and 1.48x magnification for comfortable eye-level viewing with the ability to preview image effects in real-time. Alternatively, the 3.0" 1,037k-dot tilting touchscreen LCD monitor can tilt upward 80° or downward 50° to suit working from high and low angles and its touchscreen design provides an intuitive means for controlling settings and navigating through the menu system. Both of these viewing mechanisms are housed within the ruggedly-designed dust-, splash-, and freezeproof magnesium alloy body. A large grip is integrated into the construction to provide a comfortable means for handling the camera and also facilitates more efficient control over a wide range of camera settings. Additionally, the incorporation of an X-sync socket, HDMI port, external microphone jack, and hot shoe also add to the E-M1's overall functionality. For refined off-board control and image sharing, built-in wireless connectivity is available and, when paired with the Olympus O.I. Share app for iOS and Android mobile devices, remote sharing and control over the camera is possible. QR Code Connect provides a simple, seamless way of linking mobile devices to the camera and the option of utilizing a smartphone to embed locational data into the image files for geotagging is also supported. The 16.3 megapixel Live MOS sensor and TruePic VII image processor work in concert to enable high resolution still imagery, full HD video recording, and notable low-light quality sensitivity to ISO 25600. The combination of these two technologies also helps to promote high-speed performance throughout the camera system, including a top shutter speed of 1/8000 sec. with a mechanical shutter, a continuous shooting rate up to 10 fps with Tracking AF, and continuous 6 fps shooting with continuous autofocus. Additionally, full HD 1080p movie recording is supported at 30 fps with stereo sound in either the MOV or AVI format. A Direct HD Movie Button is available for instant access to movie recording and a range of Art Filters and effects can be applied while recording for more creative control. An external microphone jack is also available to enhance the quality of sound during recordings. The sensor also affords dual-mode auto focusing that utilizes both contrast- and on-sensor phase-detection methods to quickly and accurately acquire focus. The contrast-detection system employs 81 areas while the phase-detection method uses 37 areas and, when combined, make the FAST (Frequency Acceleration Sensor Technology) focusing system that is able to reap the benefits from both technologies to produce all-around focusing that is equally fast as it is precise. Four different AF area sizes can be used, too, with the smallest, Super Spot AF, enabling pin-point precision that is well-suited to macro and close-up imagery. Selectable 3 x 3 groups within the 81 areas in contrast-detection can also be paired according to the subject type being photographed and a 0.044 second focus lag time ensures quick focusing for moving subjects. In-body image stabilization helps to minimize the appearance of camera shake with any lens in use and compensates for camera movements up to the equivalent of five shutter speed steps. Furthermore, this unique image stabilization system works across five axes, versus the conventional two axes, and compensates for vertical angle rotation, horizontal angle rotation, horizontal shift, vertical shift, and rolling camera shake movements. This range of detected movements serves to benefit traditional still image shooting as well as movie recording and working with moving subjects more effectively. Furthering the effectiveness of the 5-Axis IS, IS-Auto mode is available to detect both vertical and horizontal panning to automatically deactivate image stabilization along the detected panning axis to enable greater stability when tracking moving subjects. For eye-level viewing, a bright 2,360k-dot electronic viewfinder is integrated into the design and features a smart eye detect function, 29ms image display lag time, and 1.48x magnification. This finder enables realistic, high resolution viewing in a comfortable position that is especially beneficial when working in bright conditions. The viewfinder also allows for real-time visualization of different camera settings, including aspect ratio, highlight and shadow, and magnification. The adaptive brightness settings also enable easier viewing in different lighting conditions, with the brightness being set according to surrounding conditions to better simulate the use of an optical viewfinder. In addition to the viewfinder, a large 3.0" 1,037k-dot tilting touchscreen LCD monitor is also available for live view monitoring, image playback, and menu navigation. The monitor's design can tilt 80° upward and 50° downward, making it well-suited to use from both high and low angles. The intuitive touchscreen control offers a range of additional functionality, too, including the ability to touch to release the shutter, select the focusing point, magnify the image, apply filter effects, and navigate through images and settings. Constructed from magnesium alloy, the E-M1 features a dust-, splash-, and freezeproof design that enables full-functionality in adverse conditions. The rugged metal body is also designed to be as lightweight and ergonomic as possible to support comfortable use for long shooting durations. The body is also designed to provide the most intuitive and efficient control over crucial camera settings. Eight customizable 'direct buttons' are available and can control a range of settings simply by pressing the designated button and rotating the main or sub dials. A locking mode dial is also incorporated into the large ergonomic grip and 2 x 2 dial control provides enhanced manipulation over exposure settings through the use of two dials and a function lever. Also integrated into the body's design is an X-sync socket for direct linking of external strobes; an HDMI output for connection to an HDTV for high-quality photo and movie playback; and USB and component video connections are available, too. A proprietary accessory port and hot shoe are available as well for connecting external flashes, the Olympus PENPAL, and MAL-1 Macro Light. By using the O.I. Share app, wireless control of the E-M1 is possible through using linked iOS and Android mobile devices. The mobile device can be used to preview compositions, choose a specific AF point, and release the shutter via the intuitive app interface. The self-timer can also be set and access privileges can be given for others to download select images directly from the camera. Linking of mobile devices to the camera is possible through an intuitive QR Code Connect system, which displays a unique QR code on the camera's monitor which can then be recognized by a mobile device for instant linking. Additionally, smartphones can be used to embed GPS information into image files' metadata for geotagging applications, which can then be plotted to interactive maps through Olympus Viewer 3 or other applications supporting GPS log data. The Color Creator feature allows for adjusting hue and chroma directly in the EVF with results visible in real-time. This, coupled with an intuitive GUI, permits more finite and exacting control over the color balance of an image. HDR Preview emulates the finalized look of an HDR image in the viewfinder prior to the camera processing the images together, allowing greater control and selectivity over how extended dynamic range images are taken. HDR photos are possible with up to a 12 EV-wide range of bracketed shots. 12 Art Filters are available for creatively enhancing imagery and movies and can be further adjusted by using filter variation, art effects, and Art Filter Bracketing: Pop Art, Soft Focus, Pale & Light Color, Light Tone, Grainy Film, Pin Hole, Diorama, Cross Process, Gentle Sepia, Dramatic Tone, Key Line, and Water Color. Photo Story allows recording of a scene from multiple viewpoints, which are then composited into a single image using a range of pre-defined formats. Live Bulb mode allows you to view the progression of exposure during a bulb exposure in real-time and a live view histogram shows how the exposure is built-up across all points of the image. Live Control is an advanced control panel system that displays the image and camera controls all at once; giving a broader range of controls when working in either manual or automated shooting modes. MF (Magnified Focus) Assist and Magnification Display provide up to 10x enlargement of a scene to benefit gaining critical focus when working in either manual or autofocus modes. Both JPEG and RAW file types can be edited in-camera in order to quickly crop an image, remove red-eye, and convert an image to black and white amongst other editing options. iAUTO is an intelligent automated shooting mode that allows the camera to select from 42 pre-determined modes based on the detected scene type in order to optimize camera settings. iAUTO is also effective when working with moving subject matter and can adjust basic exposure settings in order to minimize subject blur. Multiple Exposure shooting allows for the stacking of sequential exposures within the same frame for creative results. Focus Peaking benefits working with manual focus by highlighting edges of contrast in either black or white to provide a more objective means for determining critical focus. Fine Detail II technology automatically corrects for chromatic aberration based on the specific lens in use. Natural-appearing high-resolution quality is attained by applying intelligent sharpening techniques based on the lens' focal length and aperture value being used. The Dust Reduction System, in combination with the Supersonic Wave Filter (SWF) self-cleaning ultrasonic sensor unit, works to eliminate dust particles on the sensor surface by silently vibrating 30,000 times per second to dislodge any stray particles from affecting image quality. The entire sealed unit is integrated into the stabilizer and sensor assembly. Interval shooting permits sequential recording of 1-999 shots, with 1 second to 24 hour intervals, to easily shoot a series of consecutive photos. Furthermore, the series of images can be converted to a time-lapse movie for more simplified playback. An AF illuminator aids in precise focusing under low-light conditions. A slideshow with sound can be created in-camera using a range of effects, including fade-in/out techniques, control over the movie and still image mix and speed, and the option of adding a soundtrack. A 4x digital teleconverter can be used when recording movies to extend the effective reach of any lens with intuitive zooming control on the touchscreen LCD. Face Detect, Face Priority, and Eye Detection allow you to select different priorities for basing focus and exposure on. Up to eight separate faces can be detected and Eye Detection allows you to select either the right or left eye to prioritize. A built-in level gauge aids in creating perfectly level compositions based on the horizon and architectural elements within the scene. Shadow Adjustment Technology corrects for extreme contrast between shadows and highlights within an image either during the exposure or through in-camera image editing. Four different aspect ratios can be used for both still images and movie recording: 4:3, 3:2, 16:9, and 1:1. Language support: English, French, German, Spanish, Italian, Japanese, Korean, Traditional Chinese, Simplified Chinese, Russian, Czech, Dutch, Danish, Polish, Portuguese, Swedish, Norwegian, Finnish, Croat, Slovenian, Hungarian, Greek, Slovakian, Turkish, Latvian, Estonian, Lithuanian, Ukrainian, Serbian, Bulgarian, Rumanian, Indonesian, Malay, and Thai. Box Dimensions (LxWxH) 9.6 x 7.1 x 4.1"
OM-D E-M1 Mirrorless Micro Four Thirds Digital Camera (Black, Body Only) is rated 4.6 out of 5 by 195. Rated 5 out of 5 by Montegari Photography from This Camera Is a Game Changer! This is my first mirrorless system. I love it! Image quality is A+. This is a light weight, compact, well built, well thought out little camera. I've hiked with it, my back thanked me. Hiking with a Nikon D800 is tough. The camera performs outstandingly and it also triggers my nikon flashes (set to manual). I haven't used the live bulb feature yet but am excited to! I'm going to incorporate the OMD into my wedding photography and hope to switch over completely to OMD mirrorless system. My back is going to be in love with me. The quality is there. There is no reason not to. I have not tried very high ISO's yet. It is very capable at 800 and 1000. Rated 2 out of 5 by bruceM from EVF splotches I've had the E-M1 for 8 months now and am generally pleased with it. Good image quality and very customizable. Great ergonomics and small size make it a pleasure to shoot with. However, I too have already had to have a warranty repair due to green splotches in the EVF (apparently caused by sunlight entering the EVF from the rear). Definitely sounds like a serious design flaw if one was required to continually block the EVF eyepiece from any direct sunlight. My biggest concern is the problem reoccurring out of warranty. 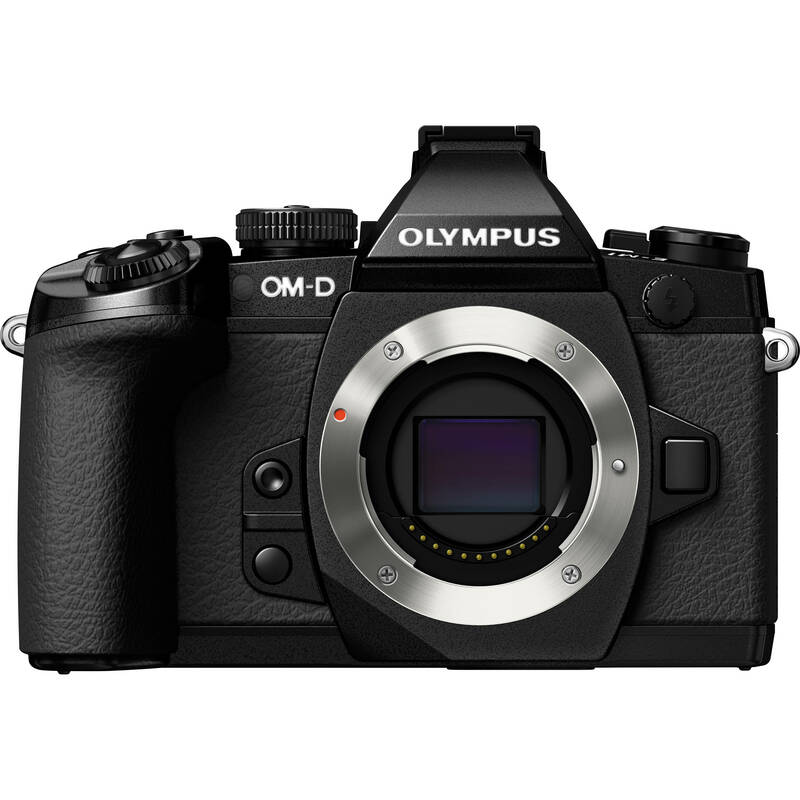 Thus far, Olympus has refused to officially acknowledge the issue, but if you do a little searching you will see it is affecting quite a few owners. Rated 5 out of 5 by Greg from This will help with the manual Coming from a Canon 7D I thought this camera would be a simple transition. The instruction manual (as mentioned by many) does not help. There is hope! This youtube video on tutorial and tips helped a lot! http://www.youtube.com/watch?v=Kn0IMHRJrM4 One area of my concern is the lack of micro L glass at the high end (300mm). I do have the 4/3 50-200 SWD lens that for quality is good but for tracking and focusing is passable. I initially looked at this camera as a backup camera. As I get more comfortable with the camera I now plan to dump all my Canon equipment;my primary reason is weight. Functionality of the camera pushed me over the edge. It is a winner! Rated 5 out of 5 by drookie from Great little camera If you are looking for a semi pro dslr replacement look no further. It's small but is still very comfortable. Image quality is on par with 1.5 crop and 1.6 crop sensors. It doesn't match a full frame but it's a third of the cost. The auto focus is good and on par with most dslrs. It doesn't match the top guys like the 1dxs and d4s of the world. It's just a little slower and doesn't track fast moving object as well. It did better then what I expected though. I haven't shot any football or fast sports yet but it does kids playing in lowlight indoors just fine. Great lenses available as well. Did I mention that it's small! Rated 5 out of 5 by J from E-M1 - Perfect Replacement for My DSLR I use the E-M1 for Event, Portrait, Landscape, Fine Art and Street Photography. It is a fraction of the weight (and cost) of my former DSLR. The fast-focusing and in-body stabilization are amazing! Images are clean and beautiful up to 3200 ISO. My clients are delighted. I plan to purchase another E-M1. Most of my prints are 20x30 posters (16x24 image size). This is one awesome machine. After two weeks and several photo shoots, no negatives to report. Rated 5 out of 5 by Jim from A Wonderful camera I had 2 DSLR's from Olympus and they were great cameras with super lenses. When Olympus stopped support for their dslrs and went to the micro 4/3rd format, I switched so that I could use my present lenses with an adapter (see below). I have taken many pictures that came out great under conditions that my other cameras could not do. I took many pictures at night of not well lit monuments in DC that came out well focused and bright. Some were hand held, due to the 5 axis stabilization system. I could go on and on raving about its handling, customization etc. but you ought to try it. You will be extremely pleased. Rated 5 out of 5 by photog4fun from Just what I wanted I am thrilled with the size and quality of my Om-D E-M1 camera that I have had now for 2 months. I have the 12-40 (24-80 FF equivalent) 2.8 SHARP PRO lens on it and also a 75mm 1.8 SHARP lens (150mm FF equivalent). I carried it all in a small purse size camera bag on my Fall Foliage trip to New England last month. The quality is right up there with my 7d & 17-55 2.8 lens, although in a much smaller package. My favorite parts of the camera are its brilliantly bright viewfinder and focus peaking with manual focusing, both a treasure. Being weather sealed, it was wonderful not worrying about my camera when I was shooting in a light rain. I love, love, love this camera. Now I am ready to sell my Canon cameras / lenses. Rated 5 out of 5 by jjividen from Simply the best As a professional, I need equipment I can trust in any weather. I need equipment that can bring my vision to the print for the wall or client needs. It should be light, strong and durable, and have unmatched quality of imaging power to make the viewer sit up and take notice. My camera system should be supported by a plethora of highest quality lenses which work quietly enough for video work and fast enough to stop any moving object if desired. The camera should be quiet so as not to interfere with a wedding vow as other camera models clank and slap to the nearby listeners chagrin. My camera is an Olympus OM-1 and I am absolutely in love with it and the joy it brings me when I see the day's output in Photoshop CC. A bit pricey as yet but worth every penny spent to enjoy the camera of the year as proclaimed by more and more photo critics. Regarding AF Focus Adjustment on E-M1 (custom menu K: utility), will the function work with a Panasonic 100-400mm f/4-6.3 lens mounted on this body? My copy of this Panasonic lens backfocuses somewhat on my E-M1, but I don't see any effect when I change the E-M1's AF Focus Adjustment, even at +20 or -20. Thanks! If the lens cannot be made to properly focus, we would have to suggest taking the lens and camera to a camera service center. I have an older Olympus brand tripod. I just bought the OMD EM-1 micro four thirds camera. My tripod requires a 'shoe' that screws into the camera body and snaps onto the tripod. I need to purchase the shoe only. It doesn't look like B&amp;H sells these, or even the Olympus brand tripods. Is that correct? You seem to be referring to a quick release plate. As quick release plates are dedicated to the tripod or tripod head of the specific model you own, we would need to know the brand and model of the tripod or tripod head you own. You would have to e-mail your inquiry to photo@&lt;a href= http://bhphotovideo.com target= _blank &gt;bhphotovideo.com&lt;/a&gt; with the above information for us to see if we carry a quick release plate for your tripod. I've read that there are issues with the viewfinder. Seems that stuff appears on the viewfinder lens internally for unknown reasons. Has anyone experienced this? How prevalent would you say this problem might be? I have had no problem with the E-M1 viewfinder. For that matter, I have had no problem whatsoever with this camera but for losing the eyecup a few times. Is lens from the E-% compatible to the OM-D E-M1? Lenses from an Olympus Four Thirds camera, such as the E-5, are fully compatible with the OM-D E-M1. But they can only be mounted on the E-M1 by using the MMF-3 Lens Mount Adapter. I currently have an older Olympus Camera (E-300), and I have lenses that work with that-if I were to go to this camera, mirrorless-do I need new lenses? Yes, the E300 is a Four Third lens mount, the mirrorless Olympus cameras use a Micro Four Thirds mount. You need to get an adapter to use your Ft lens on mFT cameras. Be advised that these lens will focus much slower than they would on your E-300. Currently, there is just one camera called the EM-1 that will focus faster with your legacy lenses. However, the AF speed will still be slower. This camera the EM1 is the top of the line in the Olympus range and you'll pay more accordingly. Yes, it comes with a flash, although I haven't found any use for it. You can adjust the ISO so much, you can get good shots indoors with low light without a flash. If purchasing this camera and underwater housing, which lens is best for underwater macro and what port should be purchased for the housing? will canon lenses fit the e-m1? No, not without an adapter.